Be the first to share your favorite memory, photo or story of Marceil. This memorial page is dedicated for family, friends and future generations to celebrate the life of their loved one. Marceil A. 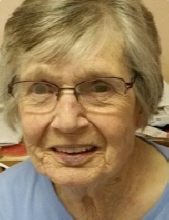 "Marcie" King age 89 of Maumee, Ohio passed away on Saturday, February 9, 2019 at St. Luke's Hospital. She was born in Toledo on May 2, 1929 to Charles N. and Mary Ellen (Murphy) Stewart. Marcie attended Whitney Vocational in Toledo and was a member of St. Patrick of Heatherdowns Catholic Church and it's Rosary Altar Society. She is survived by her sons, Allan (Felicia), Joseph (Tracey). John (Marrice), Kenneth (Kim), Bernard (Karen), Howard (Sheryl) and Paul (Karen) King; 15 grandchildren; 11 great-grandchildren; sister in-law, Marion Stewart and brother in-law, John Knapp. In addition to her parents, Marcie was preceded in death by her husband, Edward in 2002; sisters, Alicemae Justen, Clarellen Knapp and brother, Charles N. Stewart Jr. The family would like to thank her caregiver, Kathy for her patience, understanding and the exceptional care Marcie received. She allowed our mother to stay in her home 3 additional years. To send flowers or a remembrance gift to the family of Marceil A. King, please visit our Tribute Store. "Email Address" would like to share the life celebration of Marceil A. King. Click on the "link" to go to share a favorite memory or leave a condolence message for the family.